Looking for a “more-than-stocking-stuffer” gift for the lady in your life who worships a frizz-free coif? 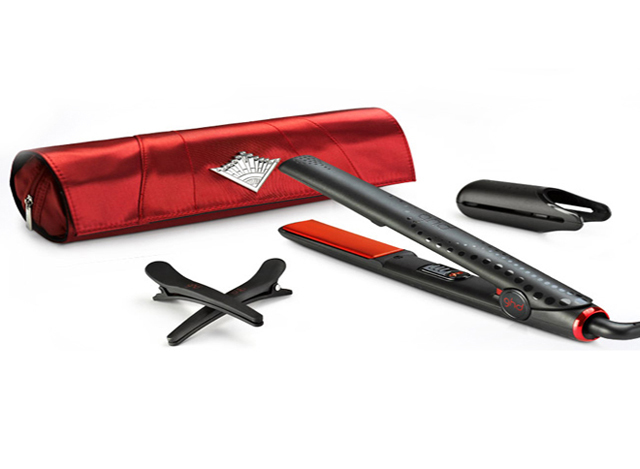 Keep your wallet away from gift certificates for keratin, and look no further than the ghd Scarlet Limited Edition styling iron. Borne from the British company known for its “iconic” stylers and considered a “cult must-have for women in search of beautiful hair,” ghd is at it again, ten years later. While it rings in at not-so-much cheaper than your local keratin treatment (currently between $225-$240 at Sephora), it will last longer, work faster, and comes in an “art-deco-inspired” scarlet clutch (and, per the ghd website, intended to recreate deco 20’s styles). It also maintains the line’s signature rounded barrel to create curls or waves. Users will appreciate the quick-to-heat styling plates, but do note that there is no temperature adjustment. The wand glides effortlessly, and as the inch-wide plates glide through, they will not snag your hair. They also apparently “promote luster.” Moreover, the styler comes with a protective plate guard, two sectioning clips, and of course the bag, which happens to be heat-resistant and makes for easy and fashionable travel (although no promises that airport security will not mistake it for a weapon). Go ahead, make her Christmas, or, as suggested by ghd.com, perhaps you’ll want to make your own.